I talk about the CAGR from time to time in my courses, the Compound Annual Growth Rate. This is a finance measure that is used to assess how well an investment has done or is doing over a number of periods or years. As part of my efforts to provide as much help as possible on the CAGR I did a bit of research and found this formula on the MS web site: FV^1/NPER/PV – 1. It was early in the morning and I couldn’t get it to work: it said -96.34% for the example I have just given. Cut a long story short, that was just wrong and with a bit of thought, I realised the CAGR formula is (FV/PV)^1/NPER – 1: that worked. Warning: watch out for duff formulas on sites that ought to know better. Wayne Winston is a clever man and a while ago, a few years, I learned from him to use the the correct mathematical approach to the CAGR. Wayne said, make it appropriate and he gave an example of a company enjoying exponential growth: the company in the example I have already used, above. In that case, Wayne plotted the actual results on a graph and used Excel’s trendline function to derive the Exponential regression equation y = 58.553e^(0.5694X) = 58.553EXP(0.5694A5). 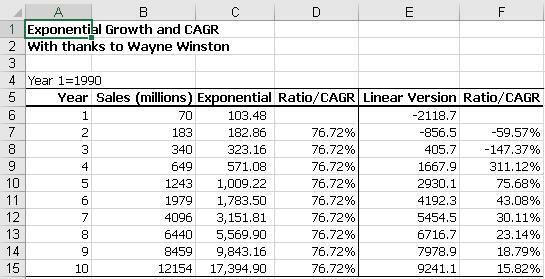 Wayne’s version of CAGR in that case was 76.72% and not the 67.48% I have already shown. That image comes from the attached spreadsheet which shows the story in full but the message is: know your data before you commit yourself and be very careful when using a formula that is wrong by about 150%! Look at the exponential and the linear graphs … they should help to show you that Wayne is right!